Giddy up, because this fall and winter the cowboy boot is making it super easy for us to stay stylish and comfortable. The best street style outfits are proving more and more that cowboy boots are the must-have investment du moment. Take a look at these cowboy boots outfits that are fighting for the top spot on my current wishlist. From classic and easy to combine all-black to vintage brown and modern and minimalistic white: this trend has some options too! Always fun when there are multiple on-trend options to an emerging cool item. This is when you get to play the game of personal style. Deciding which one fits you best. When fall is around the corner the hunt for the best booties begins. Because next to a good coat or jacket, shoes build your outfit. The best thing about boots is that they go with almost everything to any occasion. From a date after work or a day filled with appointments: boots are your go-to buddies. That’s why this cowboy trend is such good news to me. A leather shoe that is as easy to wear as easy on the eyes is a no-brainer for my wishlist. Looking back at the SS19 shows, there was an overload of cowboy boots. Western in a modern version at Calvin Klein, knee-high cowboy boots at Tibi and square toe-ed booties at Loewe. A different version to match all kinds of fall and winter outfits. Ofcourse this wearable type of shoe made its way (walk) from the runway to the streets. 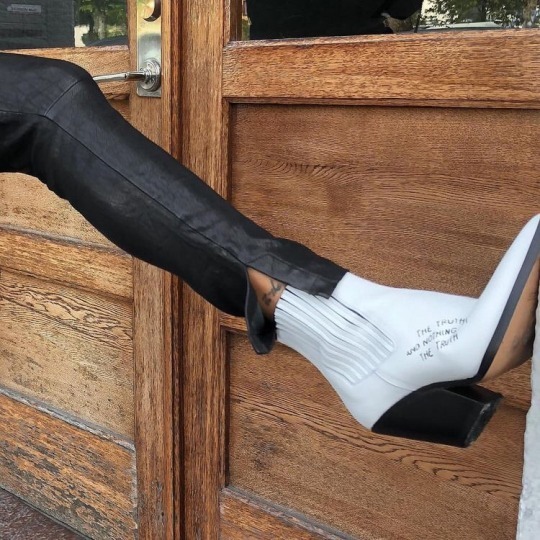 The most loved ones are Ganni’s black and white Scandi update of the cowboy boot which is also available with a hot pink twist. But to be honest there are western beauties in overflow. Which might make me go for shorter and longer versions in more than one color! For Love and Lemons Cherry Sundress. The perfect summer dress. This Balenciaga Cotton Shirt With Bow is one of the gems of their blue infused collection. Leave it up to Balenciaga to make us want to wear our logo’s proudly. This logo printed Balenciaga Cotton Shirt match your wardrobe seamlessly and give it the update it needs for this season. The Victoria Beckham Shirt has a beautiful updated version of the vintage checked pink pattern. Be totally on trend with this pastel pink, one of the sweet and bright colors we see on every runway this season. This shirt comes with a matching pants which makes for a contemporary and easy to pair set. This Victoria Beckham pants is an updated version of the vintage checked print. The sharp and smart silhouette make it not only super comfortable but also very fitting. This cool pink pants has a higher rise and comes with a matching shirt.